Offering you a complete choice of products which include Cardiology Medicines such as Capecitabine Tablets, Actilyse Injection and Elaxim Cardiology Medicine Tablets. Uses:- enecteplase a tissue plasminogen activators (TPAs) group of drugs is prescribed to prevent mortalities associated with acute myocardial infarction. 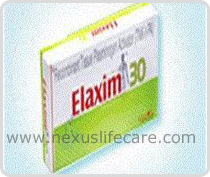 Elaxim Cardiology Medicine Tabletsincrease circulatory levels of plasma and dissolve thrombotic clots.